This luxurious face mask is made up of Fatty Acids, Hyaluronic Acid, anti-stress ingredients. Recommended for dehydrated, irritable and sensitive skin. Apply twice a week on face, neck and cleavage and remove 15-20 minutes after. 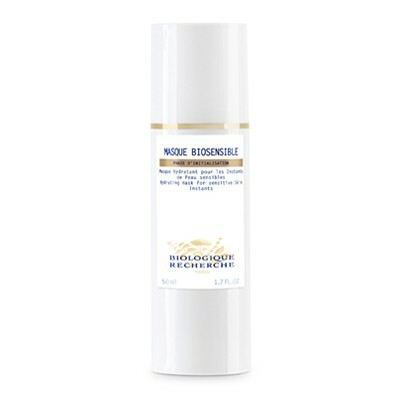 This fresh, luxurious cream mask is enriched with Fatty Acids, Hyaluronic Acid, and the Specific Biologique Recherche Oxygenating Complex. Its formula contains high concentrations of active ingredients renowned for their high tolerance. It soothes and softens your skin. It is recommended for dehydrated, sensitive and reactive skin. After using the appropriate Cleansing Milk and Lotion P50, apply Masque BioSensible once or twice a week in a thin layer over the whole face, neck and cleavage or damaged areas. Leave for 15 to 20 minutes and rinse off with tepid water. For him: relief from razor burn. Mix 2 parts shaving foam with 1 part Masque BioSensible for a gentle, smooth shave.